Winter Bells is an original solo harp composition by Sylvia Woods. 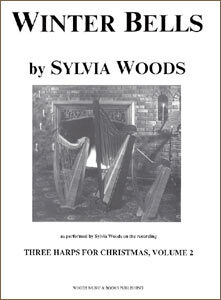 The sheet music is an exact transcription of the way Sylvia performed it on her recording 3 Harps For Christmas, Volume 2. It is for intermediate to advanced players, and is in the key of E minor (1 sharp). There is one accidental that can be left out if necessary. 4 pages with fingerings. You can read Sylvia Woods' helpful tips on how to learn this piece in our "Fun Stuff" section. If you purchase this sheet music along with Sylvia's Two Christmas Medleys sheet music, you will automatically receive a $2 discount in your shopping cart.